What can you say about a device that Mark Todd of Todd's reviews called "Mickey Mouse?" Like Todd, you can say it works. I'll go a bit further and say it works well. I actually think it looks rather nice. And, for $30, what's to lose? 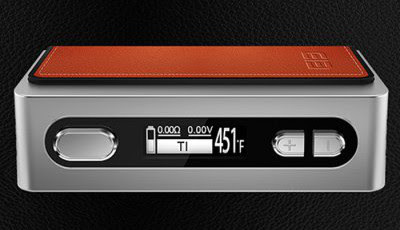 This is the Elephone Ele Cigar 70 TC Box mod. 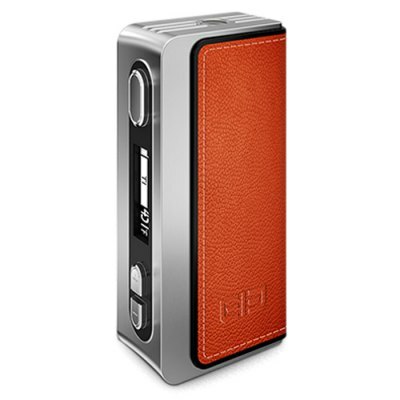 It is a 70 watt, single 18650 mod that offers temperature control over Ni200 and Titanium. It supports atomizers (in TC mode) as low as 0.05 Ohms. The device is 80mm x 40.5 mm x 25 mm with a very nice, large, OLED screen, up and down buttons and the fire button on the front, and a wrap around aluminum and leather sleeve over a stainless steel body. It's kinda hefty, but in a solid feeling way. Under that wrap around leather and aluminum grip, which is held on quite securely by 2 magnets, is a slot for a single 18650 battery with polarity appropriately marked with both a battery and + and - symbols. As always, make sure the battery installed in the device is a high-drain, safe chemistry battery, and button-top batteries need not apply. The grip is also the only place any branding appears - there is an embossed El3 logo on each side. On the bottom is a micro USB port and three grooves that appear to be decoration only, and on top is the stainless steel and spring-loaded 510 connection, and another three grooves. These grooves do not supply any air to the 510 pin. 510 air fed atomizers will not work. The center pin appears to be brass. The controls and screen are set on a slightly raised platform in the front of the device which is slightly concave. All in all, it is very nice to hold and use. There is little to no button rattle (for those that care about such things), and the buttons are quite clicky and easy to find by touch. Every atomizer I have tried on the device has sat flush and worked without fail. In the box, along with the mod, was an extraordinarily short USB cable, and a small, but better-than-average manual. I do wish the USB cable were longer, but at this point, I have enough USB cables to charge every device I own twice over... Not enough ports or chargers, though... The inclusion of a wall wart would have been nice, but in no way expected at this price point. I purchased the unit with a brown leather sleeve, but it appears to be available in white and black. I have even seen some replacement covers available for the device on FastTech in pink and red, too. I might have to get the red one at some point... I initially thought the leather was just plastic, and I have not peeled it off completely to check, but I did kinda fray one corner a little bit with a fingernail, and I am beginning to think it is real leather of some sort. Nice! The menu system is relatively simple, but not like most of the DNA styled devices on the market. Power on takes five clicks, and from that state, another five clicks will turn it off. Once powered on, holding down the up and down (helpfully, but needlessly marked + and -) will allow you to change mode. You can choose from Ti, Power, and Ni. Locking the resistance of a temperature control coil is accomplished by pressing the - button, then the power button. The device will remember the last TC coil installed and will not update the resistance until it is told to do so. Swapping atomizers and not re-locking the resistance can lead to some interesting vapes. Locking the system (including the fire button) is accomplished by pressing the + button, then the fire button. There appears to be no stealth mode and no way to flip the screen. Turning the mod around to read the screen (or learning to read upside down) is really not that much of a problem, and is easily overlooked for the price and features of this device. In power mode, the wattage range is from 5 to 70 watts. I am getting about a half day of vaping on a single Samsung 25R (baby blue) when vaping in wattage mode at around 40 watts. The 40 watts on this device feels about like 40 watts on most other devices. It appears to be fairly accurate. I do not hear any rattlesnaking or whine when firing. Not too shabby. In temperature control mode, the range is from 212 to 662-degrees Fahrenheit (100 to 350-degrees Celsius). I've not performed a cotton burn test, but I have vaped several tanks bone dry and never had a dry hit. Instead, at 420-degrees F, I get a pleasant vape. A bit warmer, maybe, than the vape I get off of several other devices, At 440-F, it's quite nice. I have run both Ni200 coils (a little cooler) and Ti coils on the device. In TC mode, I am getting at least a full day from the battery. Note that in TC mode, there appears to be no way to alter the wattage. However, the it fires quite quickly with no noticeable delay, and little ramp up time. There appears to be no pulsing when approaching temperature protection and the device does not display any kind of temperature protection message. In fact, the only two ways you'll know that it is working is that the vape gets cooler, and, if you look, the voltage indicator changes. Passthrough vaping while charging is not mentioned anywhere in the manual, and although I was able to use it while charging, I would avoid doing so. My computer does not recognize the device when I plug it in and I could find no mention of firmware upgradability on Elephone's website. As the device already supports Ni200 and Ti, and appears to do it well, I do not find this to be problematic. I do find it a bit odd, though, considering that Elephone's primary business is Android cell phones*. I do wish there were a way to add stainless steel TC at a later date, but, again, at this price point I see no reason to complain. I've had the device for about a month, and in that time, I've come to really appreciate it. It IS sturdy. This was demonstrated to me on the second day of ownership when it was knocked from a waist-high counter onto a concrete floor. My wooden drip tip was demolished, and there's a small scuff in one corner of the aluminum and leather cover, but that was it. The device still works flawlessly. If this device were lost today (I am not sure I could destroy it, it's that solid feeling), I would replace it. I mean, for $30 for a solid TC device, who wouldn't? Finish - 10/10 - I think it looks nice, and I can find nothing the complain about. There are very few rattles even when shaking it quite hard. The battery cover fits nicely, and comes off easily enough, but not accidentally. The buttons are clicky and tactile. The screen is set in no way crooked. There aren't even any exposed screws to complain about. Form - 9/10 - I suppose one might consider the edges a bit sharp, but I think of them more as refined than sharp. Some will complain about the USB port being on the bottom, and, I suppose, I can agree with that con. The weight when compared to similarly powered mods (IPV D2 and eVic VTC Mini spring to mind) is a bit heavy, and the size is a bit larger, but with that heft comes a feeling of sturdiness I truly appreciate. The screen is gorgeous! Function - 8/10 - Although I do not think it is a con to not have a reversible screen or a stealth mode, they must be mentioned as a lack. Further, the lack of any kind of temperature protection warning display (aside from the changing voltage) is a bit of an odd omission in a TC device. Also missing is the "new atomizerOther than that, this device is great. The menuing system is different, but very simple. It fires on time, every time, and I have yet to experience a dry hit when using TC mode. The battery life is on par with other devices in this wattage range. Thanks Shawn. This is a nice looking mod and kind of puts me in mind of the heftiness of my Sig 75. The leather is a nice touch and your reviews have never steered me wrong.